I recently received my perfect-bound copy of Balanced Is the Rose by one of the world’s most talented poets of haiku, Jack Galmitz. A few things struck me as I read these 69 pages, each with what I would call a haiku couplet – two per page. Even as I absorbed his words and felt them, and absorbed them and felt them again, I learned a few things. Less is best when “the empty space” is filled with intangible sensations, when the worth of the small shows its might in subtle ways. Jack has a way of gently speaking to the heart, of filling that space – not the mind, but the heart. He uses words merely as the messenger of meaning to stir emotion in the reader. Openness and honesty are the greatest pathways to the heart. As a prime example, the first section of Balanced Is the Rose is full of sorrow, loss, death. I immediately feel for my new friend, Jack. He and I connect on a deep level of sorrow and an emotive plane of purity of heart. Jack is a good guy. He appreciates the little things in life, like I do. He understands that even insects have their place on this planet, and that all living things desire to continue until they can or must let go. Jack’s heart weighs heavy for this reality, for the suffering that is part of life, and his sentiments are beautifully expressed in Balanced Is the Rose. This haiku collection struck me with the welcome reminder that no matter how “heavy” life can feel at times, we are all connected and share equally the same burdens while temporarily locked into different places and situations. 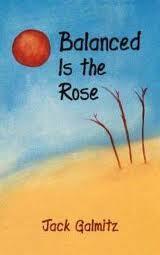 At the level of heart and spirit, we are all one, and Balanced Is the Rose reminds me of that.